The model TR20 resistance thermometer is used for temperature measurement in sanitary applications. It features a flush NEUMO BioControl® connection and is therefore particularly suited to applications where a thermowell which extends into the process medium is either not possible or not desired. 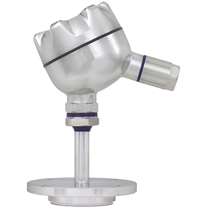 For increased hygiene requirements for those elements in contact with the surrounding environment, a stainless steel head is available in an optimised hygienic design. The TR20 in combination with the block flange (low-profile design) is especially suitable for temperature measurement in mixing and agitating vessels with a wiper. The result is a flush-mounted instrumentation at the vessel wall. Thus an easy removal of the process medium from the inner wall is enabled by means of a rotating wiper. This results in a good homogenous mixture of the components and, at the same time, accurate temperature measurement in a mixing vessel.